Yeah, I could have done this better. It probably would have been smarter to go through one timeline all the way through, and then do the other one. Oh, well, hindsight. I've edited the original posts to make it a bit clear what's going on, and they're indexed in the table of contents, so any new readers shouldn't have a problem. 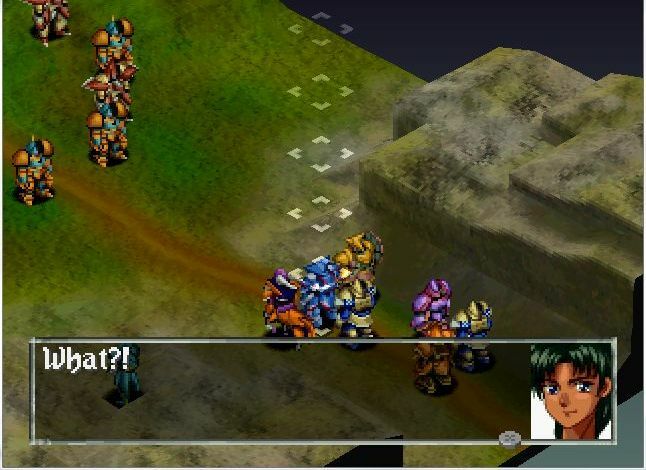 Also, they re-use some dialogue in ways that confuse the situation anymore, like Dionne mentioning a second test even if you didn't have to fight his soldiers, and who exactly Ganlon was working for. Still, let me try to recapitulate what's been happening. Bastion agreed to meet with Radcot in the desert. He got captured, but escaped with the help of Nana and Andrew. Bastion then went to Dionne-Lehve, where the Marquis gave him the stone straight-off, and the party with the stone back towards the Kingdom. Radcot tried another ambush, but Nana, his daughter forced him to flee the battlefield. Ganlon then showed up, working for the Empire. Bastion and friends killed them all, and then the events of Chapter #8, Part 2 took place. 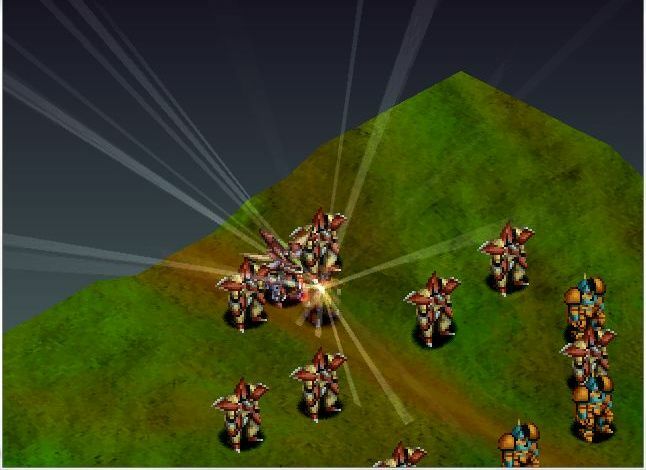 Bastion refused to meet with Radcot, who then sent his army to attack the party on the border of Dionne-Lehve. 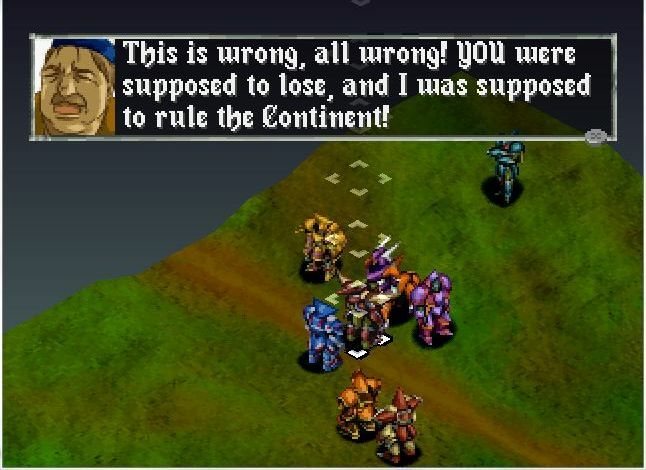 Bastion beat the Muspel Army, and met with the Marquis Dionne-Lehve, who decided to force Bastion to fight in an arena to earn Gratia. Bastion won, and the Marquis gave Bastion the stone, which was immediately stolen by Ganlon, who fled with the party in chase. And now, the conclusion of the exciting hypothetical adventures of Timeline B! : Or will I simply have to destroy the entirety of his army?! : We can, if we finish these troops quickly! : Bastion, I accidentally dropped my chocolate in Reyna's peanut butter...and it tasted delicious! 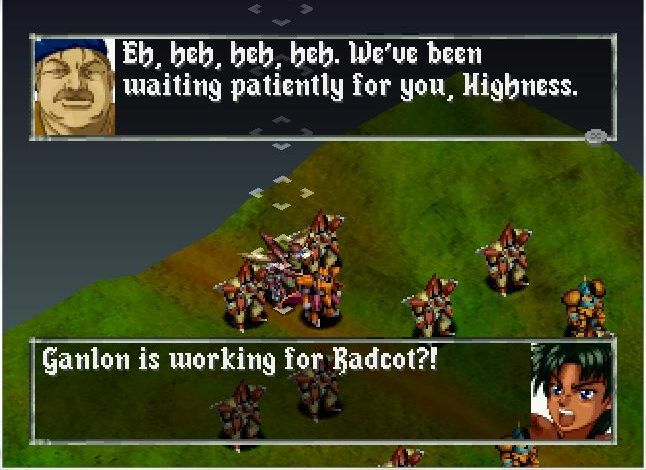 : Ganlon is working for Radcot?! : You shall pay for your treachery with your life, Ganlon! I swear it! : I hafta give credit where credit is due. Without your help, I might have never found the Gratia stone! I know you'll do the smart thing and hand it over, eh Ganlon? : I thought we agreed to, uh, discuss my position as commander of your armies first....but, ah, here you go. : Ganlon, you're a fool! Radcot's plans for you are about six feet deep! Unlike most typos in this LP, this one is in the game. And Ganlon is summarily killed by Radcot. : Unfortunately, you made that deal while ignoring the fact that I'm not a gentle man. Eh, heh heh heh. : You're despicable, Radcot. His Highness will never cooperate with a pustule like you! : Eh, heh heh heh! Pustule, emmm? Well, I'm not a stupid pustule. I know that coercion will require torture. : I believe you overestimate your chances of success in this ill-conceived plan. Give it up, Radcot! : Eh, heh heh heh! I don't think you're in any position to be giving advice. I have the Ultragunner! I AM power! And then Radcot gives a repeat of the remainder of his speech from chapter #8. The mission then proceeds about the same as the other Chapter #8. 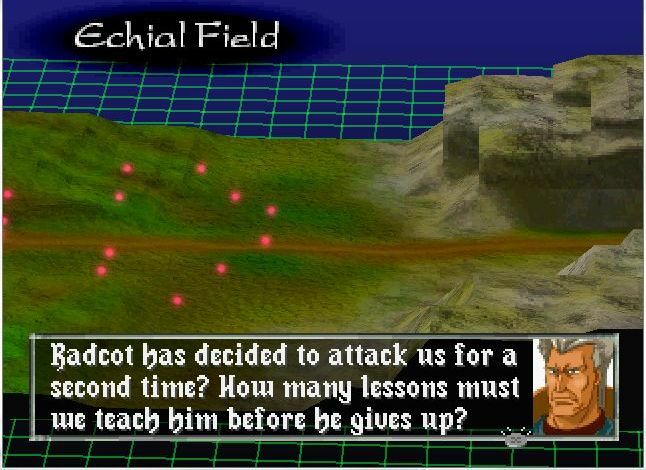 The only major difference is that instead of Ganlon and two Kingdom troopers, you have to deal with Radcot and his Bahamut ATAC, but his POW is so low that he can't really deal any damage. : I was going to have a harem! I was going to spit in Faulkner's face! All my wonderful plans ruined! Damn it all! It's not fair! : Bastion, I retrieved the stone that rightfully belongs to you. Anyway, after that, the second half of Chapter #8 is the same whichever path you go down, accounting for the scripting problems that I talked about last time. Okay, and both paths then converge in Chapter #9. Sorry about the confusion. Challenge #5 will end at 0900 Eastern Daylight Savings Time tomorrow, March 20th.